Therapeutic Inspirations - East 44th St.
Susan is a strong believer in high quality patient centered care. She uses a variety of manual techniques to mobilize and manipulate soft tissue and joint structures to improve tissue extensibility, increase range of motion, and modulate pain and inflammation. Susan's experience with proprioceptive neuromuscular facilitation also allows her to improve motor performance of soft tissue. 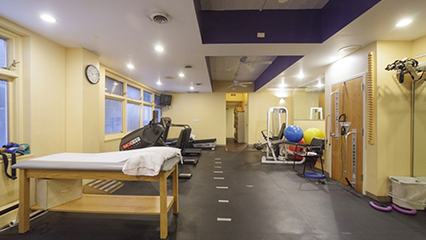 In addition to using manual techniques, Susan uses therapeutic exercise and modalities and a hands-on approach to help her patients achieve their goals. Susan began her journey at Long Island University-Brooklyn Campus where she earned her Doctorate in Physical Therapy. Upon graduating she received the Dean's Award for Clinical Excellence. Since graduation she has participated in continuing education courses offered by the Institute of Physical Art and C&M OrthoSports to expand her knowledge relating to manual techniques and to stay current with evidence based practice. Brian has been part of the Therapeutic Inspirations family for 10 years! His unique brand of charm and skill are a continuous asset to his loyal patient base and new patients alike. He blends manual and hands on therapy with therapeutic exercise to help patients return to pain free life. Brian is an avid golfer and fisherman. Elana Sidorina graduated from Long Island University with a Doctorate of Physical Therapy. She enjoys working in an outpatient setting, focusing on non or post-operative rehab, as well as sports injuries and chronic pain issues. She treats a myriad of medical concerns focusing on each client individually by performing thorough physical examinations and diagnosis while aiming toward treatments using non-surgical methods. Dr. Sidorina is also a Certified Pilates Instructor, and is an expert at incorporating Pilates and yoga into her treatment sessions. A skilled clinician, she actively engages in educating patients about their health and how they can incorporate some basic exercises in their daily lives to ease their pain. Elana understands that speedy relief is a highly valuable aspect of pain and mobility management and ensures that recuperation can be brought about quickly through her skilled therapeutic techniques Dr. Sidorina studied theater, dance, and voice, and continues to perform throughout New York City and the Tri-state area. She believes that continued movement is essential to a healthy lifestyle, and is newly learning the circus arts of aerial silks and aerial hoop. Dr. Chris Carmichael is a Physical Therapist who works with any person to promote better and more frequent movement. He believes that physical therapists are movement experts and uses his knowledge and clinical skill to improve the movement of others. He has a passion for spines, sports and screens as well as enthusiasm for endurance athletes. He is known for his unique and custom tailored exercise prescriptions for patients.